As of 2015, I have been playing guitar for 14 years, and I have also been teaching for 12. I am a relatively in-demand session player on a local level, and I am the go-to lead player (both onstage and in the studio) for those who know, like and trust me. There’s no way I could distill everything I’ve learned over the years into four points, but I do think that the things talked about here are really important tips that are often overlooked. Here are four no B.S. ways to improve as a guitarist. When you’re looking to become better at something, teachability is the most important thing. If you aren’t teachable, you might as well throw in the towel, because you won’t be open to tips, suggestions, and advice that can help you move in the direction of your goals. It doesn’t matter how good the advice is if you aren’t open to it. Let’s say that you’re working with a music instructor to improve your skills. They advise you to practice for at least 30 minutes per day, and they tell you that you should be working on your finger placement. A teachable student will take these suggestions to heart and start paying more attention to their problem areas. An excellent student will go above and beyond the call of duty to figure out how they can solve this finger placement issue once and for all. Your willingness to grow will have a huge impact on your ability to grow. It doesn’t matter whether you want to become an accomplished classical guitarist or a known blues player. If you aren’t open to trying new and different things, your growth will be stifled, and you won’t become the musician you one day hope to be. As a guitarist – especially as a beginner or intermediate player – you will often encounter riffs, scales, chords, and songs that are beyond your current capabilities. In fact, as long as you are focused on growth, you will always find new and different things that you can’t immediately play. But the last thing you want to do when you find something that’s difficult is to shrink in defeat. It’s not that you’ll never be able play it, it’s that you can’t play it right now. I would encourage you to make a list of things that you’re having trouble with as you encounter them, because eventually, you’ll find that you’ll be able to master them. Things that were once hard – or even impossible – eventually become easy and effortless. This does not mean that you should return to those things every single day. That could be discouraging. Instead, come back to them every few months, or even every few years. If you are focused on becoming a better player, and you’re putting in the work to make it happen, eventually you will be able to play what once seemed impossible. Practice is essential to your growth as a guitar player. However, if you don’t stop and let growth catch up with you from time to time, you’ll eventually become frustrated with your progress. I can remember when I made it my goal to practice for three hours a day every day for an entire year. The time and effort spent there did not yield much in terms of immediate results. The benefit of that time spent in practice was seen years later. The key point here is that you do need to stop, to rest, and to reflect every once in a while. If you never stop, you won’t be able to process what you’ve learned. To those perfectionists out there, this is particularly hard to hear, because, like me, you want to become the best you can possibly be, and you will likely use every spare moment to practice. Unfortunately, you’re doing yourself a disservice if you do that. You will become better, just not at a pace that seems in proportion to your effort. If you want to be able to measure your growth, then make sure to stop to notice it. Students everywhere fail to take their teacher’s advice to practice for a set amount of time every single day. Maybe they don’t think they have the time. Maybe they’re not passionate about music. Maybe they will never become passionate about playing the guitar. 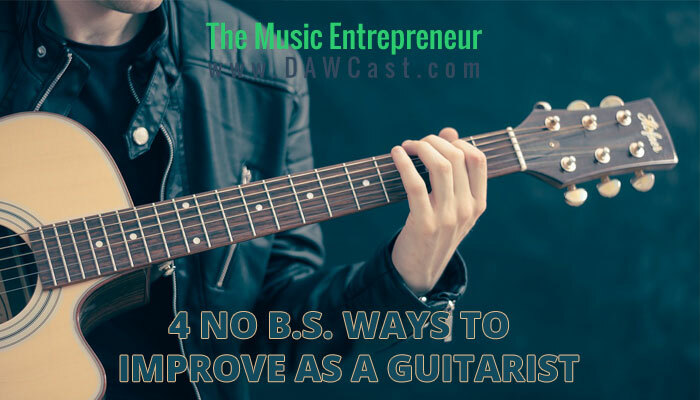 However, if you are serious about your growth as a guitar player, then you have to understand the importance of practice. You have to recognize the value of repetition, and how it can help you to improve as a player. Whenever I begin teaching a newbie how to play guitar, I always see a miracle unfold before my very eyes. I will get them to play an exercise, and the first time, they struggle their way through. Then, the second time, they’re still not sure of themselves, but their speed and accuracy immediately improves. By the fifth or sixth time, they may not be able to rip through the exercise at impressive speeds, but they’re already many times the player they were before they started! I always point this out to my students, who clearly aren’t seeing what I’m seeing. I could practice for 30 minutes today, and be a marginally better player. They can practice for 10 minutes today and supercharge their growth! What I’m trying to reinforce is the importance of repetition. If you repeat things enough, you will become better at them, plain and simple. Assuming your technique is good, you will become better at something merely by repeating it. Most players don’t repeat things enough. Don’t be fooled by the simplicity of the tips that I’ve outlined here. These principles have helped me to become the player that I am today, and allow me to continue to grow even when most people say that I’m at a point where practice only yields diminishing returns. Yes, in some ways, I’m improving at a slower speed, but that’s mainly because of the strong foundation I’ve built. I can’t unlearn what I already know, so if I want to add something to my library of knowledge and skills, I have to begin to explore areas that I’m not familiar with already. It’s called challenging yourself, and it’s something you have to do if you want to build twoards your personal best.